Before he was known as chaplain of the Golden State Warriors, Earl Smith faced a wrenching challenge when he came face to face with the man who shot him. Editor's Note: As chaplain for the Golden State Warriors, Earl Smith had a lot to celebrate when the team won the NBA Championship on June 12, 2017. Before he worked with the Warriors, he was chaplain at San Quentin State Prison. Christmastime at San Quentin State Prison, America’s most notorious maximum-security lockup. It was the job of chaplains like me to bring the inmates some holiday cheer. I didn’t have much cheer myself that Christmas. I was a brand-new chaplain, with less than five months on the job. The darkness and despair of more than 5,000 men living behind bars overwhelmed me. How could anyone bring God’s light here? Few places in the world are grimmer than San Quentin, home to America’s largest death row. The 163-year-old prison juts out into the frigid waters of San Francisco Bay, surrounded by guard towers and rows of razor wire. Cells and hallways are cramped and decrepit. Entrance to death row is through a single steel door with the words Condemned Row imprinted on the wall above. Charles Manson and the “Night Stalker” serial killer are part of the forbidding roster of murderers and gang kingpins who have all served time here. In my mind, I had accomplished exactly nothing since starting this job. Prisoners are shrewd and suspicious, slow to open up. My attempts to form pastoral relationships had failed. That day, December 13, I was handing out packets of Christmas cards to inmates who wanted to send holiday greetings, feeling more inadequate with each delivery. Nothing will do that to you more than a prison, inmate or not. They are the starkest, toughest places on earth. It wasn’t supposed to feel this way. If ever a minister was called to a job, I was called to be a chaplain at San Quentin. When I say called, I mean I heard God’s voice at maximum volume. He even used the words San Quentin. I grew up in a racially segregated neighborhood in Stockton, California. 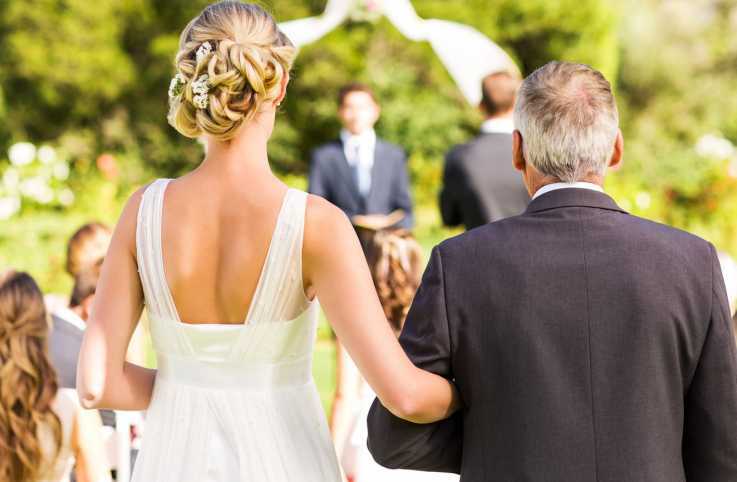 My parents made me go to church, but I was more into drugs—using and dealing. By the time I graduated from high school, I was overseeing a network of suppliers. I was feared on the streets of Stockton. People who crossed me regretted it. One evening, Michael, one of my dealers, came to my apartment. He owed me money, so I figured he was coming to pay. A guy named Steven Moore was with him. We sat down and before I knew what was happening, Steven pulled a gun and shot me point-blank six times. I dove under my coffee table. Steven calmly shot me in the back. A neighbor called police. “You’re going to die,” a doctor told me in the hospital trauma ward. Barely conscious, I found myself alone in a room, in searing pain, awaiting surgery. Suddenly, the pain vanished. Totally. 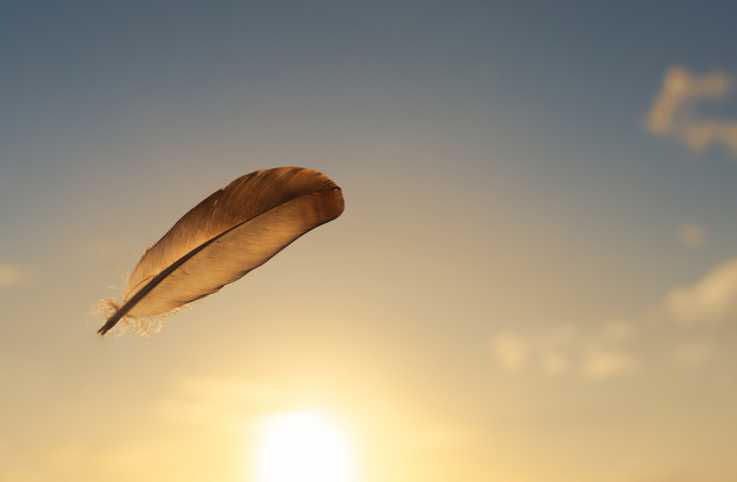 A profound peace came over me. For an instant I thought maybe I was dead. Then a voice spoke, clear as a bell: You’re not going to die. You have things to do. You’re going to be a chaplain at San Quentin. That was all. but it was enough. i started going to church again and eventually made my way to college, where I graduated with a degree in religion. Becoming a pastor was a long road. I kept relapsing into my old life, drinking and doing drugs. I even found myself wondering what it would be like to come face-to-face with Steven Moore and do to him what he had done to me. An eye for an eye, right? In college, I’d married a faithful, patient woman named Angel. With her support I got serious about my vocation. I put the drinking and drugs behind me and made amends to people I’d hurt. I even convinced myself to forgive Steven Moore. I mean, didn’t I have to say that? After 23 years as a chaplain at California's San Quentin State Prison, Earl Smith accepted a different kind of challenge: ministering to some of the world's most talented athletes as chaplain for both the Golden State Warriors of the NBA and the NFL's San Francisco 49ers. 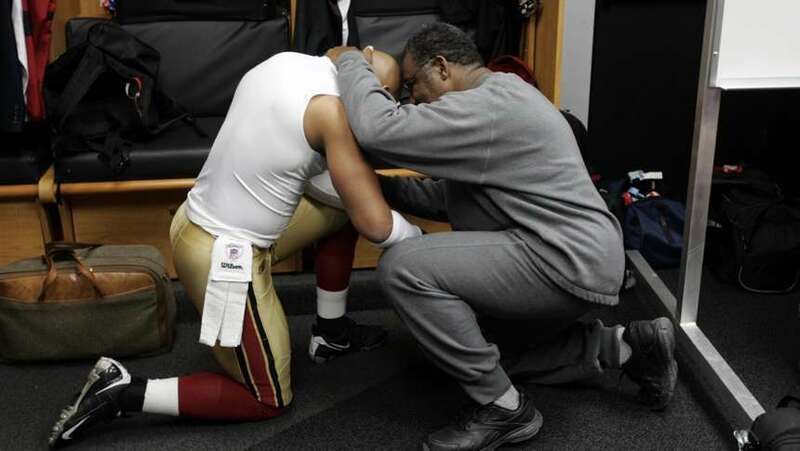 Enjoy these images of Smith lending spiritual support to the 49ers and even some of their opponents. 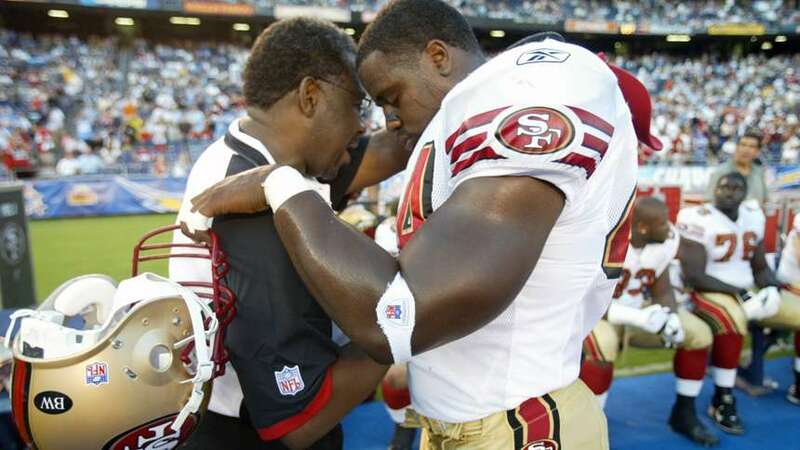 Chaplain Earl Smith prays with Moran Norris during a 2007 road game against the San Diego Chargers. Smith ministers to Donald Strickland before a 2008 game against the Miami Dolphins at Dolphin Stadium. 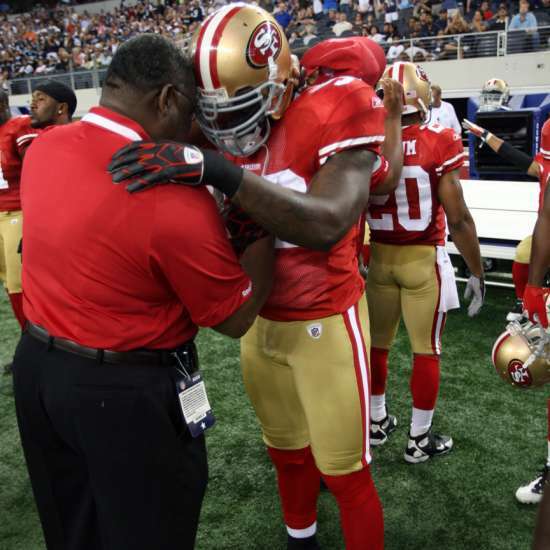 Smith prays with Patrick Willis during a 2009 preseason game against the Dallas Cowboys in Arlington, Texas. 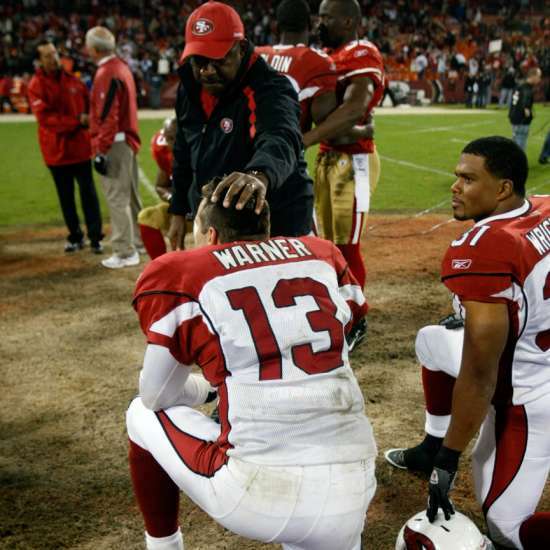 Smith greets Arizona Cardinals quarterback Kurt Warner at the end of a 2009 game in San Francisco. At right is Arizona Cardinals running back Jason Wright. 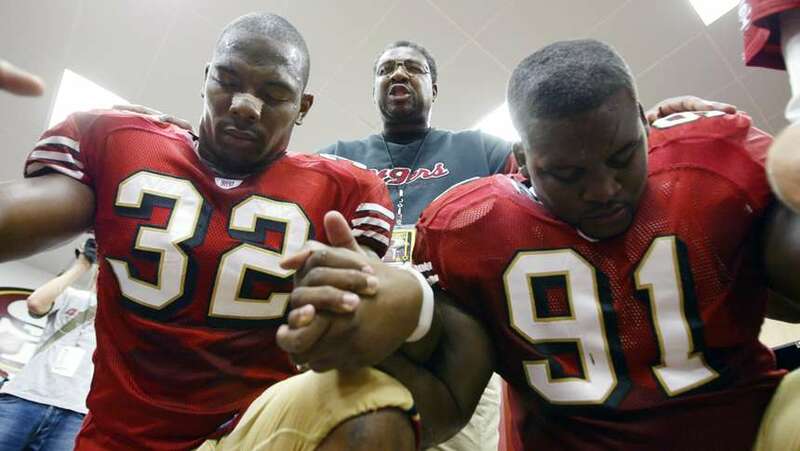 Smith prays with Kevan Barlow (left) and Anthony Adams in the locker room before a 2005 home game against the Indianapolis Colts. 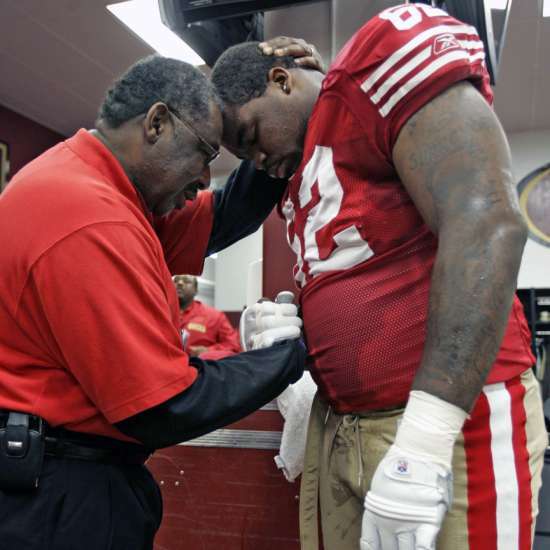 Smith ministers to Chilo Rachal in the locker room before a 2008 home game against the Washington Redskins. Read Earl's story about his years as a chaplain at San Quentin Prison! I was 27 when San Quentin offered me a job as a chaplain. I started on a six-month probationary period. Many candidates don’t make it past that period. Like me, they feel overmatched by the prison’s impenetrable despair. That December afternoon, as I pushed a cart stacked with Christmas cards down a row of cells, I figured my time at San Quentin was about over. My six-month review was coming up and I had nothing to show for myself. Obviously, God had called the wrong man to this job. I was in the section called North Block. At cell 66 I extended a packet of cards toward the inmate, who was leaning against the bars of his cell door. All of a sudden my stomach balled up. I broke into a sweat. The man looked at me blankly—a look I got from many inmates who couldn’t care less about a visit from the chaplain. His entire expression changed. His eyes widened and he jumped back all the way to the rear of his cell. “Ace,” he said with a croak. But that was a street name. I knew his real name. Steven Moore. He hadn’t recognized me at first, but I knew him on sight. How could I not? When someone looks you in the eye and shoots you pointblank, you don’t forget his face. It’d been eight years. He was a juvenile then, just 17, a budding L.A. gangster visiting family in Stockton. He’d agreed to take me out as a favor to Michael, the dealer who owed me money. Steven knew as well as I did what this encounter meant. Though I hadn’t formed any close relationships at San Quentin, I had met inmates I’d known back on the streets. All it would take was a subtle signal—me telling someone Steven had tried to kill me—and he’d be dead before Christmas. A quick twist of a shank in the yard. The harsh economy of prison runs on debts and obligations. Plenty of inmates would want to do the chaplain a favor. My heart pounded. All my old street instincts came crashing back. I had Steven Moore right where I wanted him! Hands shaking, I laid the stack of Christmas cards on the bars of his cell. I pushed my cart down the corridor. “What’s wrong, chaplain?” inmates started asking. At the end of the corridor I leaned against the wall, tears streaming down, my whole body shaking now. The only way out of the cell block was back down the corridor. Past Steven’s cell. I couldn’t do it. I couldn’t make my feet move. I stood there, the wall cold and hard against my back. With crystal clarity I saw why my ministry at San Quentin had stalled. My life had changed enormously since that night eight years ago. But the change was on the outside. If I’d truly changed, I would’ve been able to look Steven in the face and greet him in the name of Jesus. But I couldn’t. I hadn’t forgiven him. I hadn’t left my old life behind. No wonder I failed to minister to these men. Inside, I was just like them. Imprisoned behind years of slow-burning hate and anger. I pushed my cart back down the corridor, each step agonizing. I passed cell 80. Then 70. My pace slowed. Cell 68, 67. I stopped at cell 66. I was all set to say something terrifying to Steven—something so he’d know he was going to get what was coming to him. But a voice inside me gave me different words. Steven said nothing. He just stared. I hurried away, unsure what I might do next. When I finished handing out the cards, I returned to my office, collapsed in my chair and sobbed. A huge weight seemed to lift from me. I felt free. Like my own steel door had flung open, revealing a world of light and air. I remembered the peace I’d experienced the night Steven shot me. Now I knew that was just a glimmer. This was the real thing. From that day forward, my ministry at San Quentin took off. The inmates must have sensed I understood them in a new way. A few guys came to chapel. I started a prison baseball team. I played chess with prisoners. And I forged deep pastoral relationships. For most inmates, it’s the inner incarceration that’s most damaging. They carry profound pain from their childhoods. They feel worthless because of their crimes. They nurse grudges and hang on to hate. I made it my mission to help prisoners understand that even if they serve their term and are released, they’ll remain behind bars until they deal with their inner pain. Steven Moore requested a transfer to another prison. I never saw him again or told him I forgave him. That’s okay. Forgiving him was something I needed to do for myself. It allowed me to put my old life behind me for good. And to accept that God had forgiven me too. That’s how I brought a little bit of God’s light to a place as dark and despairing as San Quentin. I opened up the cell doors of my own heart. 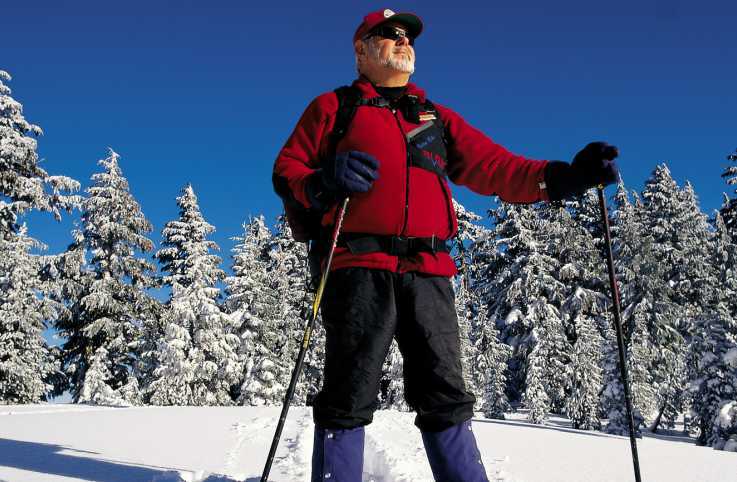 This story first appeared in the July 2015 issue of Guideposts magazine. Earl Smith is the author of Death Row Chaplain: Unbelievable True Stories from America's Most Notorious Prison, published by Howard Books (May 19, 2015).